Currently in Toronto, the emerald ash borer beetle is decimating the city’s ash trees. Over the next 10 years, about 860,000 trees will be felled because of the invasive species. Instead of simply mulching or trashing the trunks, industrial designer Miles Keller, founder of Toronto-based Dystil studio, hopes we can come up with a creative reuse. Turning the logs into art, say, or furniture. (Because the beetle kills the tree by attacking its bark, it doesn’t affect the integrity of the wood.) 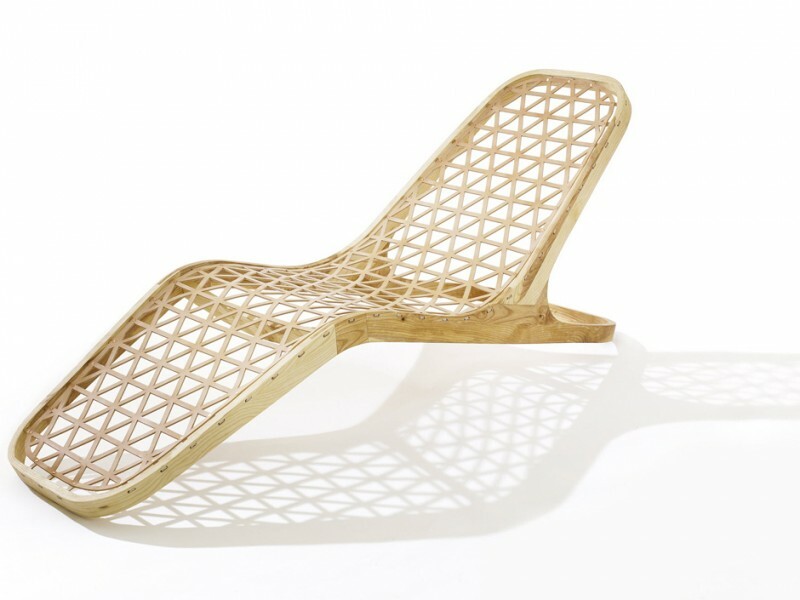 For his part, Keller has used ash reclaimed from a city woodlot in Scarborough to design a graceful lounger. Called Kona, after the Cree word for snow, it pays tribute to the long history of ash as a valuable construction material for Canada’s First Nations people. Because the wood is lightweight and a good shock absorber, it was used for thousands of years as staffs for spears or frames for dog sleds. Fittingly, Keller’s fine joinery is reminiscent of a hockey stick, and the shape and leather meshing brings to mind a giant snowshoe. From $3,500. Through dystil.ca. This entry was posted in Design Spy and tagged Chair, Chaise Lounge, Dystil, Globe and Mail, Kona Lounger, Miles Keller by mmhague. Bookmark the permalink.